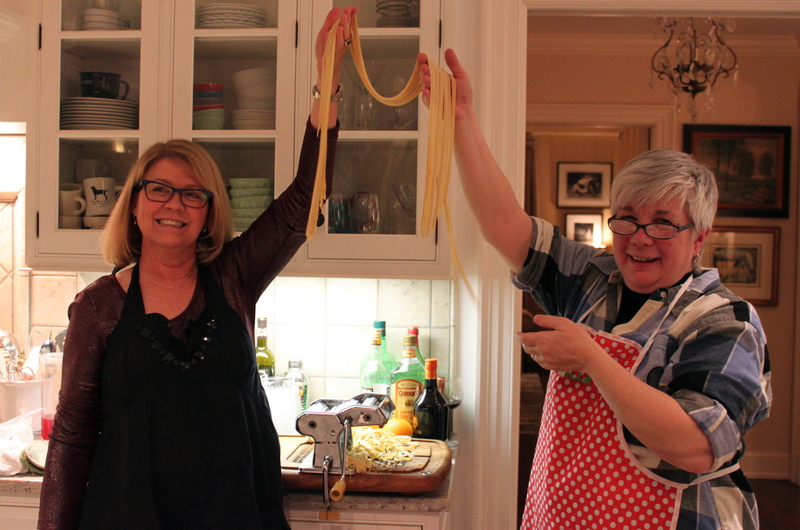 While making fresh pasta was fun – we needed some sauce to turn it into a cozy meal. We tossed the extremely long strains of linguini into three homemade sauces – a Seasonal Winter Pesto, a Wild Mushroom and White Wine and a Spicy Sausage Sauce. All were really tasty and complimented the homemade noodles really well. I made the sauces somewhat in advance and finished each off with fresh herbs before serving. The favorites were surely the mushrooms and sausage! Finally, I can’t close the series on the Off Mendenhall Symphony Cooking Class without mentioning the dessert! Tiramisu! So simple and easy – and unbelievably good. I used the Cooks Illustrated recipe for Tiramisu here (and made it the night before!). What an incredibly fun night we all had at the Mortenson’s house that night. While I was so exhausted from pulling it all together – it was worth all the fun, food, new friends and support of the Greensboro Symphony! Stay tuned (literally) for the next auction on May 17th and bid on my class! Place chile, almonds and garlic in a food processor or blender; pulse until coarsely chopped. Add parsley, sage and tomato; pulse to coarsely chop. Add oil; pulse to combine. Add cheese; pulse 1-2 times or just until combined. Season with salt. Crumble the dried mushrooms into a glass bowl or measuring cup and pour the boiling broth over them. Let steep for at least 20 minutes. Drain and reserve the drained liquid. Heat a tablespoon of butter in a large, heavy skillet over medium-high heat. Add the chopped button or portobello mushrooms and let sit, without stirring, for about four minutes or until they have thoroughly browned on one side. Stir and let them cook on the other side – again, without stirring – for about four minutes. Add the shallots, garlic, sage and steeped wild mushrooms. Turn the heat to low, and cook until they are all fragrant and soft. Slowly pour in the mushroom broth, chicken broth and white wine. Bring to a boil and cook down. Add butter and parsley to finish the sauce. Heat oil in heavy large pot over medium heat. Add onion; sauté until translucent, about 4 minutes. Add garlic; stir 1 minute. Add sausage; cook until browned, breaking up with back of spoon, about 5 minutes. Drain drippings from pot. Add wine, diced tomatoes with juice, and crushed tomatoes; increase heat and bring to boil. Reduce heat to low and simmer 30 minutes to blend flavors, stirring occasionally. Taste for seasoning – salt, pepper and sugar. Stir basil and oregano into tomato sauce. Sprinkle with Parmesan.